A Dish Soap Apron – because it makes me happy! I’ve been wanting one of these for a while. It’s so delightfully kitschy – how can you not smile? I scrolled through Pinterest this morning, looking for “retro kitchen” and “dish soap bottle dresses” ideas, and I came across this website: Home in the Finger Lakes. I printed out her pattern, but I made it wider over the “shoulders”, longer (because my bottle is tall) and fuller in the skirt. I added a cute little button at the back of the neck and a pocket. It was a quick project. I had just enough of the picot-edged bias binding. It’s been in my stash for years, because it was too sweet to throw away. It’s perfect for this. I used Aleene’s OK to Wash It glue to hold the binding to the fabric prior to stitching it, and even though it made a sticky mess of my fingers, it really was helpful. I zigzagged it in place while the glue was still wet. It didn’t gum up my needle at all. I stitched through the button a couple times and then added a little glue to that, too. The pattern recommended a wash-out glue, but I feel the permanent glue will be better here. I’m sure this will make washing dishes more fun, right? Author CathePosted on February 2, 2016 February 2, 2016 Categories Crafty Things7 Comments on A Dish Soap Apron – because it makes me happy! where your coffee mug can rest. with a muffin and the news. Mug rugs make excellent Christmas gifts, alone or as the focal point for a gift basket, with some coffee and a nice mug. Mug rugs are the perfect size for daily use, at home or even at work, for coffee at your desk. There’s room on each quilt for your cup, a computer mouse and some special treats! They have thin cotton batting and quilted densely enough to create a mat that will lie nice and flat on the table, protecting it from heat and moisture. Your rug mug is washable, just in case you splash a little coffee! Check out the mug rugs and other one-of-a-kind gift items I have listed in the GloryQuilts etsy shop right now. This one would be a great Christmas gift for a favorite teacher. I have some mug rugs available for sale at Pearson Family Farm in Ramsey, MN during their fall harvest events. It’s a great place. Their barn is full of pumpkins, squashes, broom corn, corn stalks, gourds, and all kind of fall decor. Enjoy their homegrown popcorn, browse their collection of vintage cars and farm equipment and enjoy the corn maze. Hay rides on the weekends! Do you have mug rugs? Do you use them? Author CathePosted on October 18, 2015 October 18, 2015 Categories Crafty Things, FINISHED!Tags autumn, Christmas, etsy, gifts, GloryQuilts, Mug Rugs, quilts, seasonal, shoppingLeave a comment on What is a Mug Rug? In addition to the seasonal quilt over the fireplace, I set a new autumn table runner on the mantel. Table runners are perfect for fireplace mantels and piano tops as well as dining room tables! The painted mason jars were a pinterest project. I needed a non-fabric craft to do one day, and those were fast and easy. And cheap, because I had already had the acrylic paint and some empty canning jars. I made the stuffed pumpkins last year. I used weighted pellets in the bottoms, to give them stability, but they are otherwise filled with inexpensive polyfil. They are like giant pincushions. This is one of my favorite quilts. It was a class sample for a Quiltmaking 101 class: fabric selection, rotary cutting, accurate straight-line piecing. No triangles, no curves, and few corners to match up. Most of the students made it in just two colors – dark and light. It was striking and dramatic that way, but I like these batiks and similar fabrics. Orange and blue are complementary colors on the color wheel, which is supposed to be an attractive arrangement. I didn’t start out that way, though – I was looking at browns and blues, and the rustier browns and oranges kept popping up on the design wall, In the end, the blue and orange (rust) quilt is perfect for autumn! A couple more pictures of my autumn home. That table runner is for sale on etsy, and I have another almost just like it – with green and gold coordinates instead of burgundy and green – nearly finished. How do you use table runners in your home? We have a window that angles right onto the street corner, with a miniblind that doesn’t work. You know how it is… the miniblind is large and matches the other four (in a very odd color) so I can’t afford to replace it, and I don’t want to make curtains for just the one window of the five, etc… But it’s like being on one of those TV shows where your life is on display. Any time it’s lighter inside the house than outside, drivers and pedestrians can’t help but look in. I had done this earlier this year, with regular paper, and it hadn’t turned out well for several reasons. Then a little boy in Bible study ran his fingers through it… so I got Matthew to clean the window and have been planning to do something else. So… as I was clipping coupons Saturday afternoon, I noticed that the double pages were quite large. 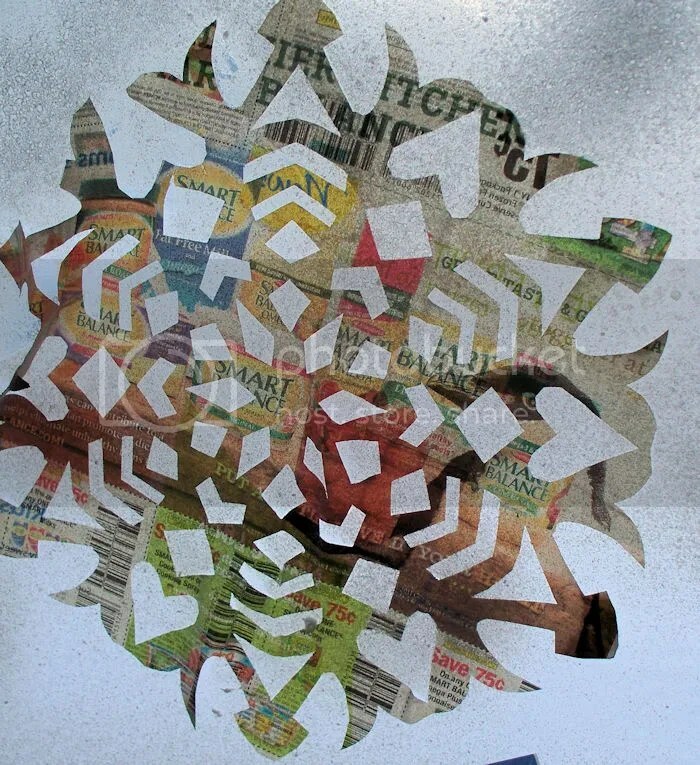 I abandoned the coupons and cut a lot of snowflakes in a few different sizes. 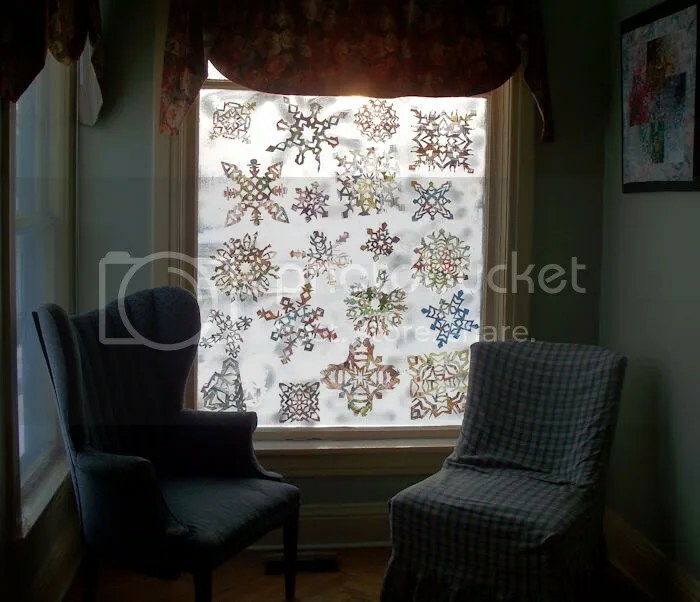 I used a pan of water to wet each snowflake and stick it to the window. They were drying and falling off faster than I could get them all up there, but eventually I finished and sprayed over them with that spray snow stuff. They were so pretty then — they looked like stained glass windows with the sun behind them. I let them dry there, because they were pretty to look at, until they fell off. I waited until dark to take the “after” picture. 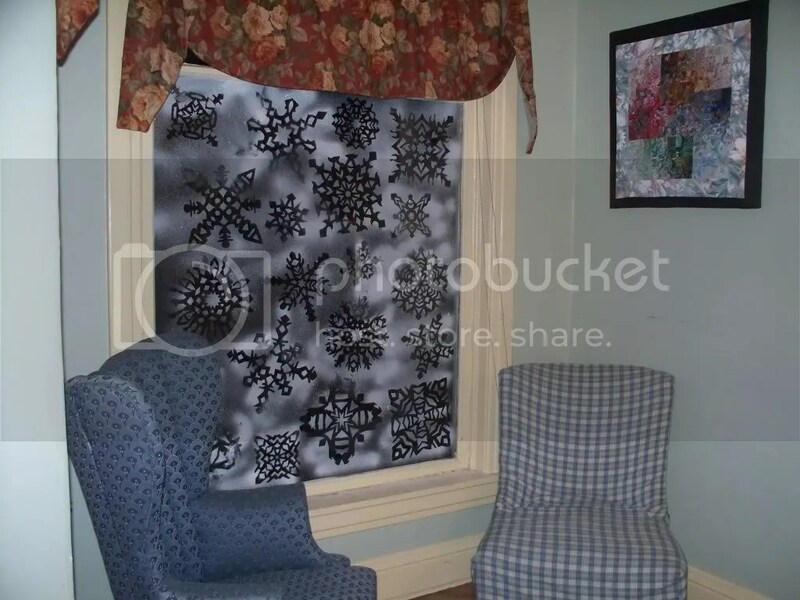 It’s not a perfect privacy screen – more like lace curtains – but it helps and still lets light in during the day. And it makes me happy to look at it.